Are pupil size calculations possible with Tobii Eye Trackers? The algorithms used by Tobii Eye Trackers allows for calculations of the position of the eyes as well as the pupil size. The optical sensor registers an image of the eyes which then is used to calculate parameters to adjust the eye model algorithms. As the eye model used by Tobii Eye Trackers provides data about the distance between the eye and the sensor, the firmware can calculate the pupil size by measuring the diameter of the pupil on the image and multiply it with a scaling factor. Several definitions exist regarding what should be defined as the size of the pupil. In the eye model used by Tobii Eye Trackers the pupil size is defined as the actual, internal physical size of the pupil. However, in most scientific research the actual size of the pupil is less important than its variations in size over time. Tobii Eye Trackers output pupil size information for each eye together with each gaze point allowing an external software (e.g. Tobii Studio) to record the pupil size variation during an eye tracking session. Researchers in a broad range of fields have been studying pupil response as an indicator of physiological arousal, anxiety, cognitive load and processing, and perception in language acquisition, development, information sciences, and human performance. If you’re entertaining the idea of using the pupil as either a corroborating or triangulating measure in conjunction with eye tracking, there are a few best practices to keep in mind. Because video-based eye trackers don’t report an actual ground-truth, physical pupil diameter (most commonly a model-generated value either in millimeters or arbitrary units) it’s advised to use only relative change measures. For example, percentage dilation. Establishing a proper baseline is essential to extracting a reliable pupil response. There are a number of approaches to doing this but they generally involve presenting a plain stimulus and then setting as baseline the pupil diameter in the several hundred milliseconds directly preceding the key stimulus. Be aware of the magnitude of the response. Unless the cognitive processing demand changes dramatically or the stimulus is highly arousing, pupil response may only be on the order of a few tenths of a millimeter. This has implications for data treatment and statistical power. You’ll probably need to add new screening questions for exclusion of unsuitable subjects. Certain conditions (cranial nerve III palsy) an medications (opioids, epinephrine, anti-hypertensives) can affect the pupil response. Use single/fixed pupil illumination mode eye trackers like the TX300, X3-120 and Glasses 2. The reason is that there can be a discrepancy in the reported pupil diameter as a result of differing image contrast due to how the pupil diameter is modeled by the system. If you keep these basics in mind when designing your eye tracking with pupil measurement study, you will find that combining direct measures of visual attention and cognitive or emotional responses to be a rich approach to human behavior research. So, while pupil size data is available to Tobii Pro users, it’s helpful to understand how measurements of the pupil using eye trackers differs from pupil measurements carried out using a true pupilometer. True pupilometers have their eye cameras positioned directly in front of the eyes. This puts the pupil opening and the eye sensor on parallel planes and render the pupil as a true circular disk. The resulting pupil image thus has no perspective distortion and a figure closer to true pupil size can be provided. Unfortunately, this also means that the subject won’t be able to see anything but the built-in target rendering true pupilometers generally unsuitable for visual attention studies. Eye trackers, in contrast, image the eye from well below the horizontal eye line. This is to provide clearance for a screen or other viewing opportunity. So, while useful for showing and viewing stimuli such as images and videos, the pupil image is almost always elliptical. 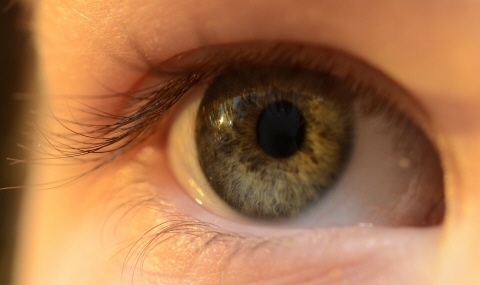 Most modern eye tracking systems perform some sort of pupil size correction due to perspective distortion (also referred to as pupil foreshortening error). True pupilometers report different pre-packaged metrics. As they are most commonly employed by ophthalmologists and the like, measures such as latency of constriction, constriction and dilation velocity, percentage change, and time to reach 75% constriction are designed to give insight into the health and pathology of the eye and visual systems. Eye tracking systems provide a different and comprehensive set of measurements relating to basic visual behavior such as fixation duration, saccade length, and visit counts. That said, it is possible to reconstruct direct analogs of any of the pupilometer measures from the raw, instantaneous pupil diameter. On this page we will explain how dark and bright pupil eye tracking techniques work. In this article we explain what eye tracker sampling frequency is and its impact on data collection. How do Tobii Eye Trackers work? In this section we will describe how an eye tracker works.